Meet our Best Architectural Design awardee for A Celebration of Design—designed by Edmund Ng, this home serves as the perfect backdrop for the homeowners’ extensive art collection. The main dining area illuminated by a dramatic presentation of LED candles. There is a fine art to displaying art — besides a careful curation of suitable works and furniture, the lighting matters as much. These are details that matter for art lovers like architect Edmund Ng and his wife. In fact, their chic abode has been specially designed to showcase their art collection. “My wife is an art collector so I conceived of the house as a canvas for her art,” says Ng, founder of Edmund Ng Architects. Together with his team, Ng has designed a family home that is unconventional and purpose-built to house the couple’s art collection. It’s now a prize-winning residential project too. This home is our Best Architectural Design awardee for A Celebration of Design, which celebrates the industry’s brightest and most innovative minds in the design scene. Take a closer look at this family home, which was featured in our April 2016 issue. Get design cues from the Ngs, on how to display art with panache. Not one to shy away from making a design statement, it did not bother Ng that the house would look unconventional due to the lack of windows. “A glass house or one with many windows will not work for the display of art,” says Ng. Light-coloured wood flooring help to keep the spaces looking airy and light; the full-length glass doors used throughout the home to create a clean and open look. The master bedroom is a sprawling 1,000 sq ft and occupies the entire third storey. Despite its palatial proportions, the soft furnishings and artwork, including an untitled graffiti piece by Dedy Sufriadi, one of Ng’s favourites for its child-like quality, imbues the room with a warm ambience befitting a bedroom. Tucked in a private corner beyond the master bath is a study- a relaxed and quiet space that looks out onto a small balcony. The guest room is kept simple yet stately like a hotel room, drawing from Ng’s vast experience in designing showflats and interiors. 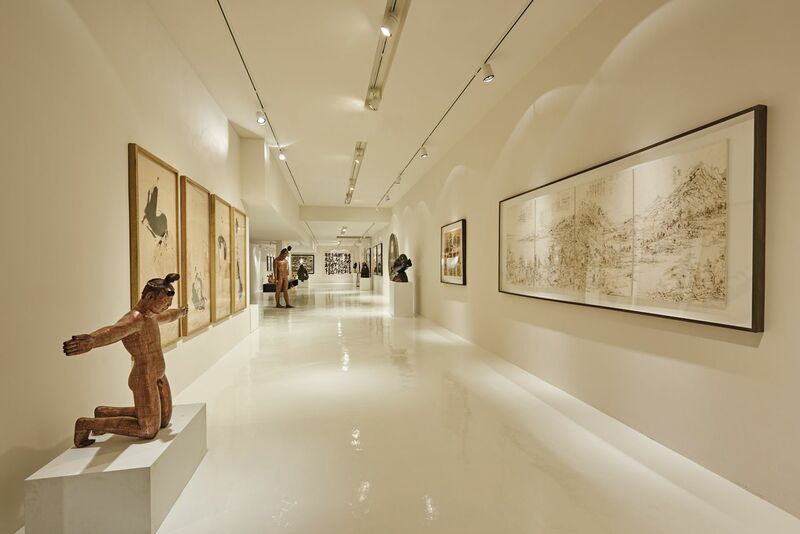 His wife’s extensive art collection is housed in a large, vault-like basement gallery. Above it is a secret hatch, accessible from a car porch above, which is used when she needs to lower large canvases into the gallery space.